Welcome to 2019 at the Millet House! Have you noticed our Circles event? Opening reception is February 8, Mesa Second Friday, 6-9 pm. The show will continue through March 9. The featured artist, Rainbow Westlund, says it takes her years to finish each painting. She is bringing these, along with prints. Also happening: We will be hosting Vermin Supreme, America’s longest-running Presidential Candidate, at the Millet House on Thursday, February 14, 7-11 pm. Filmmaker Rod Webber will show the rough cut of his brand-new film, “This is Vermin Supreme”, at our weekly pizza night! Both Vermin and Rod will be present and will answer questions. Vermin is a performance artist and peacemaker who uses humor to defuse tense situations. He also wears a boot on his head. Tuesday mornings, 10am-noon, Art Journaling with Adrian Black. You don’t have to be an artist. We are using art to identify societal issues and come up with solutions. Coffee, tea available for the asking. Thursday evenings, 6pm-whenever we are done (usually around 8 or 9pm), Pizza Night! and planning sessions. Come for a piece of pizza and an update on what we are doing. Sunday afternoon, 4pm-7pm, free painting (literally) – come and paint with our supplies, many of which were donated. Or bring us some! We can especially use more canvases/canvas boards. OR, thirdly, bring your own project of any sort to work on. This weekly event is for artists AND for absolute beginners, so don’t be shy. There’s also a light supper if you get hungry, noodles or salad or some such, vegetarian and gluten free. .
Nonprofits the world over are more needed than ever. Our nonprofit, the Floaters Foundation, works through The Millet House to help marginalized people create a better life. You can show some love by donating any amount! Even $5 will be helpful! Donate to our Paypal. The Paypal link is here: Donate ! The money goes directly into the Millet House bank account. If you do donate, please add a note so that we can properly thank you! More options to support The Millet House here: In the Mood to Do Some Good? November Open Hours: The Millet House will be open 10 am-3 pm Monday, Tuesday and Wednesday in November EXCEPT Monday Nov 12! We are also open Thursday evenings for pizza and planning, and Sunday afternoons and evenings for painting! Plus our gift shop is open all of these hours. We have prints, jewelry, original paintings and more. Tuesday, November 13, “Journaling with Artist Trading Cards,” a workshop offered by Adrian Black. The workshop will feature a discussion of the “discourse of homelessness,” in a search for causes of and solutions to poverty and homelessness. Come every week or drop in when you are able to. Sliding scale, but an initial donation of $10 is requested, along with a $5 materials fee that includes enough materials for a month of journaling. Thursday, November 15, Pizza Night at The Millet House, 6-9 pm. Come eat with us and discuss plans for art, life and the Millet House. Sunday, November 18, Afternoon Painting Party. Beginning artists can learn how to express themselves in paint with an eye toward submission to juried shows; experienced artists are equally welcome. We have supplies on hand, or bring your own. 4pm – 7 pm. Tuesday, November 20, “Journaling with Artist Trading Cards,” a workshop offered by Adrian Black. The workshop will feature a discussion of the “discourse of homelessness,” in a search for causes of and solutions to poverty and homelessness. Come every week or drop in when you are able to. Sliding scale, but an initial donation of $10 is requested, along with a $5 materials fee that includes enough materials for a month. Sunday, November 25, Afternoon Painting Party. Beginning artists can learn how to express themselves in paint with an eye toward submission to juried shows; experienced artists are equally welcome. We have supplies on hand, or bring your own. 4pm-7pm. Tuesday, November 27, “Journaling with Artist Trading Cards,” a workshop offered by Adrian Black. The workshop will feature a discussion of the “discourse of homelessness,” in a search for causes of and solutions to poverty and homelessness. Come every week or drop in when you are able to. Sliding scale, but an initial donation of $10 is requested, along with a $5 materials fee that includes enough materials for a month of journaling. Thursday, November 29, Pizza Night at The Millet House, 6-9 pm. Come eat with us and discuss plans for art, life and the Millet House. Note: Are you looking for the Call for Art: Circus? Check the red menu bar, above! The Millet House is currently open 10 am-3 pm, Monday, Tuesday, and Wednesdays. As we are volunteer-staffed, additional hours await a volunteer. For a preview of works in the show please check our page A Daily Taste of Art, where you can watch the show catalog as it is built! Also, be sure to read more about the show in our Newsletter. Tuesday, October 9: 10 am – noon. “Journaling with Artist Trading Cards,” a workshop offered by Adrian Black, currently showing at the Millet House. The workshop will further incorporate the “discourse of homelessness,” in a search for solutions to poverty and homelessness. Sliding scale, but a donation of $10 is requested, along with a $5 materials fee. The materials you receive are enough for about a month’s worth of journaling, and a discounted price will apply after the first meeting . 10 am- noon. Tuesday, October 9: TamaleTuesday Night at The Millet House, 6-9 pm. Come eat with us and discuss plans for art, life and the Millet House. Friday, October 12: As part of Mesa Second Friday Night Out, The Millet House will be open 6-9 pm. Come to our party! Art, food and friendly conversation. Meet the Artists, bring your friends. Sunday, October 14: Afternoon Painting Party. Beginning artists can learn how to express themselves in paint with an eye toward submission to juried shows; experienced artists are equally welcome. We have supplies on hand, or bring your own. 4pm – 7 pm. Tuesday, October 16: 10 am – noon. “Journaling with Artist Trading Cards,” a workshop offered by Adrian Black, currently showing at the Millet House. The workshop will further incorporate the “discourse of homelessness,” in a search for solutions to poverty and homelessness. Sliding scale, but a donation of $10 is requested, along with a $5 materials fee. The materials you receive are enough for about a month’s worth of journaling, and a discounted price will apply after the first meeting . 10 am- noon. Tuesday, October 16: TamaleTuesday Night at The Millet House, 6-9 pm. Come eat with us and discuss plans for art, life and the Millet House. Sunday, October 21: Afternoon Painting Party. Beginning artists can learn how to express themselves in paint with an eye toward submission to juried shows; experienced artists are equally welcome. We have supplies on hand, or bring your own. 4pm – 7 pm. Tuesday, October 23: 10 am – noon. “Journaling with Artist Trading Cards,” a workshop offered by Adrian Black, currently showing at the Millet House. The workshop will further incorporate the “discourse of homelessness,” in a search for solutions to poverty and homelessness. Sliding scale, but a donation of $10 is requested, along with a $5 materials fee. The materials you receive are enough for about a month’s worth of journaling, and a discounted price will apply after the first meeting . 10 am- noon. Tuesday, October 23: TamaleTuesday Night at The Millet House, 6-9 pm. Come eat with us and discuss plans for art, life and the Millet House. Friday, October 26: Closing Reception for “Contemplation in the Wasteland”, 6-9 pm. Come to our party! Sunday, October 28: No Afternoon Painting Party at The Millet House today, but we are scheduled to make fry bread & demonstrate our art at St. Barnabas Episcopal Church in Paradise Valley. We have the experts! The Millet House is hosting an Opening Reception on Friday, September 14, 6-10 pm for featured artist Craig Thornton. Craig has chosen the theme of “Contemplation in the Wasteland” which, for him, includes figures of strong character in beautiful but harsh environments. He states that science fiction and a personal mythology have influenced this work. The supporting artists have contributed their interpretations of the theme, ranging from a quilt in honor of migrant children who have died crossing the desert, to a shawled figure surrounded by symbols of Native American culture, to a collage representing the “junk food wasteland”.. The Millet House is located at 440 W 1s Street, Mesa AZ 85201. Refreshments will be served, and you will be able to meet many of the artists. Other Open Hours for the show are yet to be arranged but will include Mesa Second Friday evening on October 13 and a Closing Reception on October 26. For further Open Hours as they are announced see our website, Facebook, Twitter, or Instagram (details below). You are invited! Closing reception for Synchronicity (at 60) will take place on August 25 (not August 24 as originally planned) and the Millet House will be open from noon to 10 pm on that date. The day will feature an interactive art project led by Jaime Glasser from 4 to 6 pm. The focus of the day will be on collecting YOUR ideas on how to bring about connected communities through art. Drop in any time after noon; wine, lemonade and snacks follow the art project, in a closing reception at 6 pm. The Synchronicity exhibit showcases the work of Mesa artist Jaime Glasser, accompanied by Juried Artists and the Millet House Art Collective. Jaime conceives of her show as a way to embrace the simple joy of sharing her journey, as she turns sixty. 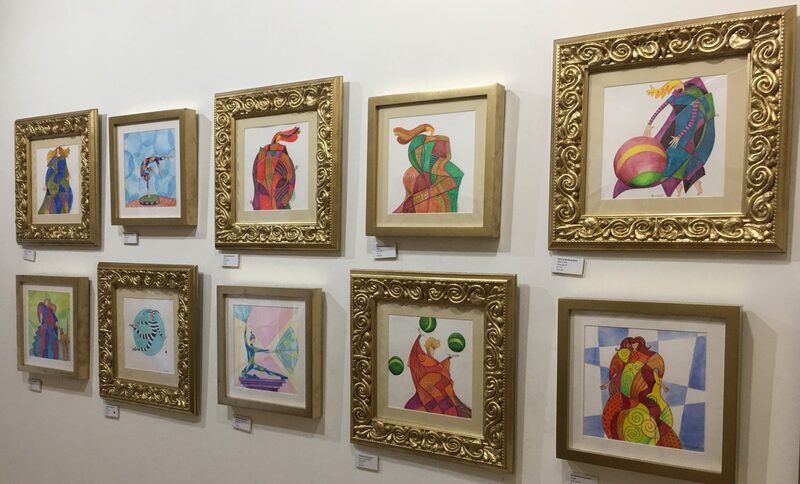 If you purchased art from this exhibit, you may pick it up at the reception, 6-10 pm; if you have art on exhibit, you may likewise take it home with you, or return on Sunday or Monday. Join artist Andrea Rogers for Shubui: tie-dyeing Japanese paper for use as collage in paintings, cards, borders on mats for framing, bookmarks, lampshades or any other creative products you may envision. The paper is extremely beautiful to see and glorious fun to design. Andrea Rogers has been working with tie dyed paper for over 4 years. Her paper/wood earrings are available at Visions Gallery in Chandler and at The Millet House in Mesa. Below, examples of Shubui dry on a clothesline. The paper dries quickly and you will be able to take your creations home with you.